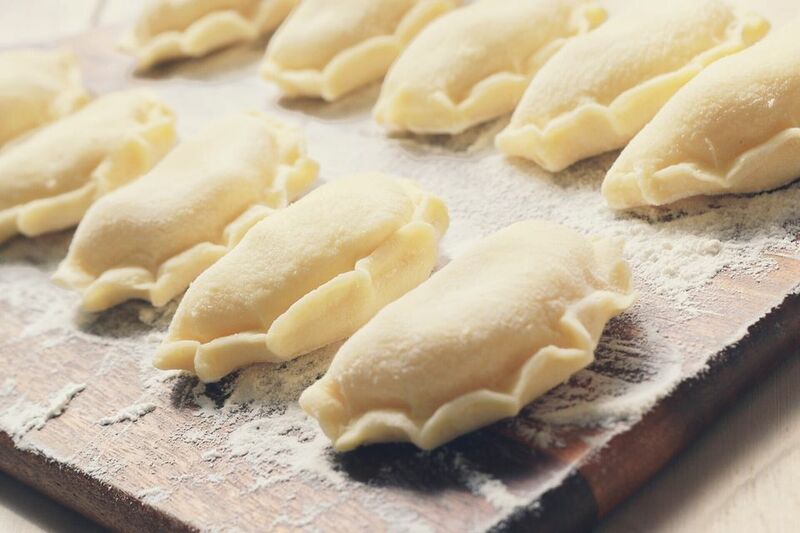 This pierogi dough for Polish dumplings uses potatoes as one of its ingredients. Leftover mashed potatoes from yesterday's dinner are not a good candidate because they usually contain butter and milk. Those additions will change the consistency of the dough and you will have to make other adjustments like, possibly, adding more flour which can toughen the end product. Choose one of these savory filling recipes or one of these sweet filling recipes to complete your dumplings. Mash or run cooked potatoes through a food mill or ricer into a large bowl. Add oil, egg, flour, salt, and water to the potatoes and combine well. If the dough is dry, add more water, 1 tablespoon at a time, until moist. If the dough is sticky, add more flour, 1 tablespoon at a time, until it's smooth. On a floured surface, knead dough 3 or 4 minutes or until elastic. Cover dough with plastic wrap and refrigerate at least 30 minutes. Roll, cut, fill and cook pierogi. People say potatoes were the rise and fall of Ireland, but spuds figure prominently in Central and Eastern Europe as well. Potatoes (known variously as kartofle, ziemniaki depending on which region you live in) were virtually unknown and sometimes considered poisonous, in Poland until quite a bit after Columbus brought them back from the Americas. It is believed King John III Sobieski introduced this tuber to Poland in the mid-1600s after tasting them in Vienna. They caught on in a flash because they could be relied on to get people through the winter if grain crops failed. A combination of the right soil and farming know-how has made Poland one of the top 10 world producers of potatoes. And they show up in every imaginable course, including dessert. Even vodka is made with potatoes. Check out Chopin Vodka, for example. Savory Potato Pie Recipe: This dish is known as baba kartoflana, literally "grandmother potato" for its comforting qualities, no doubt, since it is made with potatoes, onion, garlic, bacon, and eggs. Potato Cutlets With Mushroom Sauce Recipe: These are crispy croquettes made with mashed potatoes and served with a creamy button mushroom sauce.